Though cozy mysteries can and should be read at all times of the year, winter brings with it the perfect weather for curling up inside and reading mysteries by the fire. That same weather also makes it the perfect time of year to fire up the oven and experiment in the kitchen, and Cozy Cat’s cookbook, Cozy Cat Cooks: Over 20 Authors Share Recipes, will help you expand your repertoire with enticing recipes from your favourite Cozy Cat Authors. The cookbook can be purchased from Amazon. This week, we’re cooking Diane Weiner’s Vegetarian Squash Bake, a hearty meal that is a cinch to make, leaving plenty of time to devour her Susan Wiles Schoolhouse mystery, Murder is Collegiate, available from Amazon. 2. 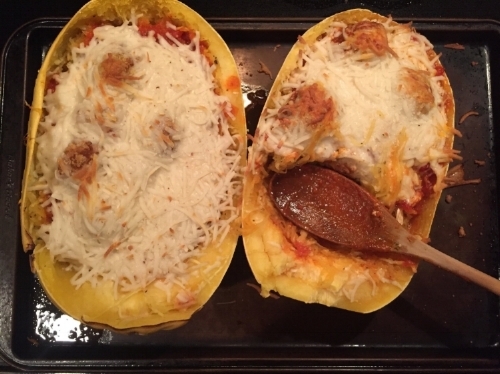 Pierce the squash a few times with a fork, put in the microwave for 8 minutes or until it’s easy to cut. 3. Cut the squash in half lengthwise, take out seeds and dark strands. 4. Microwave soy crumbles so they are defrosted (1-2 minutes). 5. Heat oil over medium heat in a frying pan. Sauté the garlic, then add soy crumbles and water. 6. Scrape the squash flesh using a fork until it separates and looks like spaghetti. Put in a bowl. Add soy crumbles, ¾ cups mozzarella, salt, pepper, Italian seasoning, and 2 tablespoons of Parmesan, stir together. 7. Fill the squash halves with the mixture, top with tomato slices. Place on a baking sheet or in a baking pan, bake on lower oven rack for 10 minutes. 8. Top with remaining cheese, move to top rack and broil until cheese starts to brown, about 2 minutes. Stay tuned next week for a sweet finish to our Eating and Reading series.